When an older adult has a stroke, one of the challenges they may have when they return home is preparing and eating healthy meals. Many stroke survivors are instructed by their doctors to make changes to their diet to prevent another stroke, making the task even more complicated. In addition, they may have lost all or some use of one arm, making it necessary to learn to do things in the kitchen in a whole new way. If your elderly family member has suffered a stroke, below are some tips to help them get back into the kitchen and eat well. The dietary changes necessary after a stroke make it very important to plan healthy meals. It can be useful to plan out a week or so worth of meals and create the grocery list based on the menu. Another good option is to prepare meals ahead of time that can be frozen and reheated. That way, family caregivers, home care providers, and the stroke survivor can team up for a day of cooking and tackle the task all at once. Having the right tools for preparing foods can make the task easier. There are many adaptive tools available that allow people with trouble gripping or who only have the use of one hand to cut and chop ingredients. There are rocker knives and knives with thicker handles for better grip. You can also use electric food processors to quickly chop foods. They can be useful for making purees if swallowing is difficult. An adaptive cutting board is also a necessary tool. The boards suction to the counter to prevent slipping and have spikes or straps to hold food in place while the person uses their good hand to cut. Home care providers can assist the older adult to use adaptive tools in the beginning until they become more adept with them. 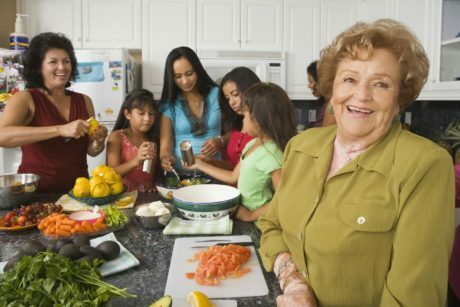 If your aging relative enjoys cooking and is determined to get back in the kitchen, it can be tempting for them to jump back in and try to plan a complicated meal. However, it may be best to start with a small, simple recipe to set them up for success. It will take time to learn to cook in a whole new way and starting out with a failure could be discouraging. A home care provider can assist the senior to make simple meals at first, then work their way up to more elaborate foods as they become more comfortable in the kitchen.